I really enjoy the sets in the LEGO Architecture series, and I am especially excited by the upcoming “Trevi Fountain” set. 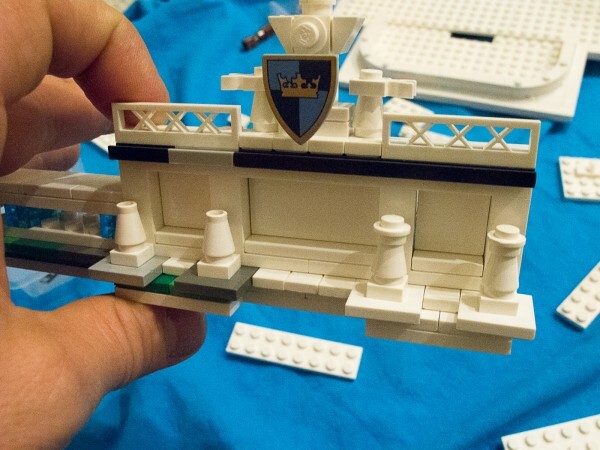 Rather than simply wait for the set to come out, I wanted to get a sneak peek at the build by trying to build part of the model without a list of parts or instructions. I also wanted to see if there are any rare or expensive parts hiding in this set. To be clear, I never intended to finish the entire model. 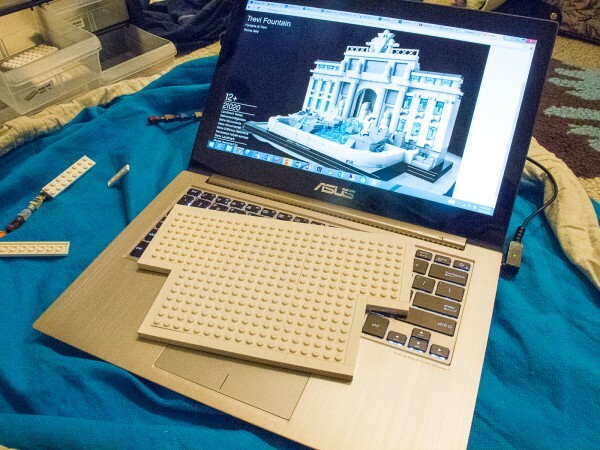 Even though I have a significantly enhanced LEGO Architecture Studio set, I doubted that I would have all the bricks that are needed. I just wanted to explore some of the interesting parts of the model, especially the half-stud offsets that create a lip around the top section of the building facade. I started by building the base. My guess at the top facade. Next, I started with the top of the building facade. It was easy to recreate the very top section and I’m pretty confident I did it correctly. Beneath that, we have some front-facing 2×2 and 2×4 tiles, likely attached using a bunch of 87087 – Brick, Modified 1 x 1 with Stud on 1 Side. 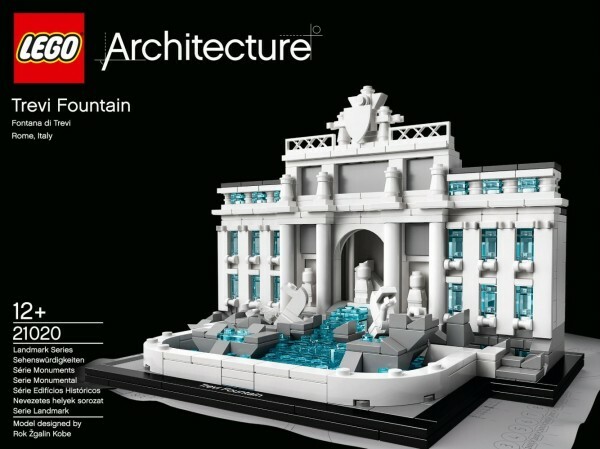 I hope that’s true, as it is a very useful piece and it was not included in the 21050 – LEGO Architecture Studio set. This section also seems to use a ton of 87580 – 2×2 Jumpers, and I couldn’t figure out how to get some of the offsets without also using part 89737 – Tile 1×3 Which was also annoyingly omitted from the Architecture Studio set. I continued down the facade, struggling a bit to achieve the appropriate half-stud offsets to align the windows with the obvious front-facing 1×6 tile. It looks like you will use at least 12 more of 87087 – Brick, Modified 1 x 1 with Stud on 1 Side to attach those front-facing tiles, so I expect that part will be getting cheaper on Bricklink soon. I could not achieve the appropriate offset to the window without using jumpers, and to my eye, I think we are looking at 1×2 Jumpers in Trans-Light-blue (3794 or 15573). If I’m correct, someone will be making real money on Bricklink, as it is currently a 45 cent part. Based on the photo, this looks like it will be a great addition to the Architecture series, even though it is more of a “sculpture” than a building. My hands-on experience building sections of the model reinforced my fondness for the design. The model has very fine details which are expertly rendered. I didn’t explore the sculptural forms in the fountain, but I think they are well done, especially given the relatively small scale. Speaking of scale, this is a pretty large model for the Architecture series. I think it will be about the same size as Villa Savoye, although I hope they follow the precedent of the UN Headquarters and give the set a very low price per part, especially given that many of the parts are small. Further, based everything I can see in the photo and everything I could guess based on building part of the model, I think this is going to be an extremely popular set for people to buy just for the parts. With so many white and clear bricks, it looks like a perfect addition to a growing “Architecture Studio” set for free-form creative architectural modeling. 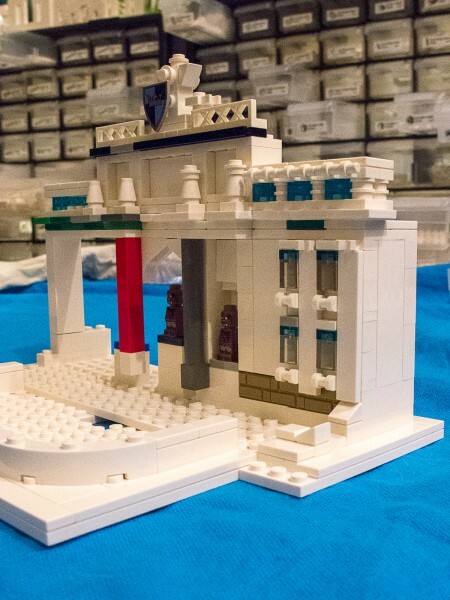 Speaking of which, check out my LEGO Architecture 30-day Challenge. I built 30-different projects in about 30 days. They run a broad spectrum, and some of them are really cool! 2×2 Jumpers in White have been on PAB walls for a few months now.